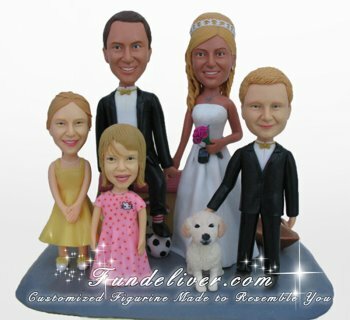 This is a completely customized family theme wedding cake topper ordered by one of our customers. They ordered 4 figurines in their original plan, but when the cake topper came out. They love it so much and then added their third and youngest kid, the girl wearing Hello-Kitty. That is also why there are only two kids in 2D draft, but in final product there are three kids. They want the bride to wear a strapless wedding dress holding hands with the groom which is wearing a classical black smoking with a sandy/tanned bow tie. The bride holds in her free hand a flower bouquet which has peach colored roses. And the bride has a necklace of two interlinked hearts also wears circle diamond earrings and the wedding band. An IPhone is sticking out of the grooms pocket and a gaming controller is hanging from his belt and one of his feet has a white/red football sock on, trousers up and standing on a football. A Blackberry is hanging from the brides dress. They are standing in front of their house and next to them is their dog, Max and their two kids from his earlier marriage. The kids are dressed next to them, the boy is wearing a classical smoking and girl is wearing a simple tanned/sandy dress with straps. A boat next to the house is not a bad idea either as they live next to the ocean.